Hello, I was wondering if there was video capture software using Leopard OSX that can record streaming web video. I know that there are a few I've heard of like VLC but they are kind of hard to figure out to use. And I was just on the search for something that was easy to use. Thanks a lot guys! * With the built-in streaming video capture software for Mac, QuickTime is limited to full screen, which will increase space of the recorded video, and will record both the sound from the Mac speaker and any background noise from your room. That's why there is an increasing demand for easier ways to reach this goal. The following tutorial will share two ways to download online video on Mac using YouTube downloader and streaming video capture software under Mac OS. 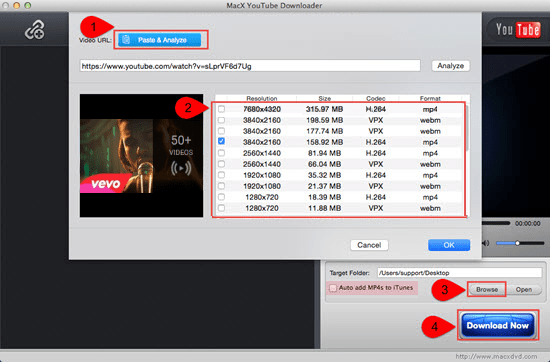 MacX YouTube Downloader is highly recommended as it supports downloading online streaming videos to MacBook Pro/iMac/Air at thunder fast speed. It's 100% free and safe, and will help free download online videos from 300+ sites in HD/4K quality, no matter you're running on Safari, FireFox, Chrome, Internet Explorer, Opera or others. Step 1: Download the best free YouTube downloader software for macOS and get it launched. Find the online video to download, copy and paste the URL and click "analyze" to load the video details. Or you can simply click "paste & analyze" button to auto detect the video opened in browse. Step 4: Hit "Download Now" to start downloading streaming flash video on Mac with this free streaming video recorder. Another way to capture live streaming videos on Mac can be achieved with the assistance of MacX Video Converter Pro which is a piece of handy video recording software to record any screen activity taking place on Mac. It can capture videos media from video-sharing websites like YouTube, Dailymotion, Yahoo, Metacafe and non-downloadable sides like Hulu, ABC and BBC without slowdowns while making the recorded video/audio quality in original high definition perfectly. 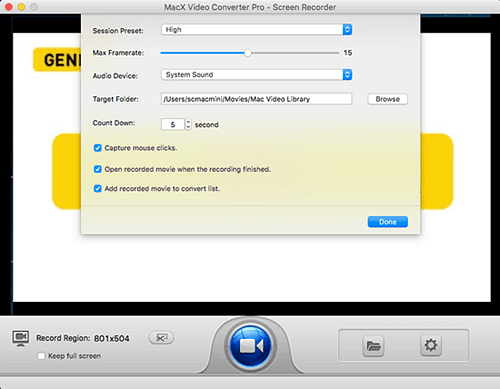 Below is how to capture streaming video on Mac using its built-in screen recorder. Free download the screen recorder on Mac (Windows version is also available) and fire it up, hit the "Screen Recorder" button. In this area, you can feel free to customize the screen recording area by choosing "Keep Full Screen" or "Record Region". What's more, before you record streaming video on Mac, you are allowed to choose the quality of video to be recorded, adjust the video frame rate, add sound effect to your video, and more. Click "Start Record" button, the program will start capturing streaming video with HQ audio on the screen within a few seconds. You are free to record video game, gameplay footage, streaming movies, and much more. Note: MacX Video Converter Pro integrates screen recorder, slideshow maker, YouTube downloader, video converter and editor in one tool, which means you can not only record streaming video on Mac but also convert the captured video to MP4, FLV, AVI, MPEG, MOV, etc for playback on iPhone, iPad, Android, etc with world's fastest speed due to the aids of Intel QSV hardware acceleration tech. Free download the best screen capture tool - MacX Video Converter Pro to easily capture streaming video from YouTube, Vimeo, Dailymotion and tons of other video sites with the highest quality reserved, thanks to High-quality Engine.